The article below is a guest post from my long-time friend and coach Rick Becker. Rick and I ran together on the Reebok team years ago. 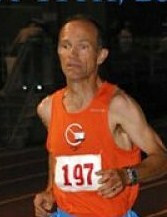 Rick is a national and world champion master’s runner in the 5k. In addition, Rick won the world cross country championships in his age division. Rick is also a 2A cross country coach of the year in Washington State. As Rick states in the article below, athletes can attain “monster improvements” if this training is incorporated properly in a runner’s season training plan. Rick practices what he preaches. He uses Alternation workouts in his own training. I will write an article about how Rick uses the Alternation workouts in his own training in a future post. The New Interval training/Alternation workouts are not gimmick workouts. I’ve used them myself in training athletes. If this type of training is incorporated properly in a season training plan, major improvements in running times are likely to occur. This workout teaches the body to recover while running fast resulting in faster race times. Since a great deal of focus is needed for both portions, one’s focus/concentration improves improving the mental aspects needed for racing including racing relaxed. Blood lactate remains high in this workout teaching the body to work at higher levels. This workout teaches the body to remove lactic acid during the slower portions (though not entirely). The effort and stress levels felt in this workout are more specific to challenges one will face in race situations. This workout will result in monster improvements. This workout teaches the body to help prevent lactate from accumulating. It also teaches the body to disperse it quickly while maintaining a steady pace enabling an increase in aerobic capacity. Including both portions the total mileage will be four miles. This is a continuous workout without stopping. This pace will be one’s 5k goal pace. You can start off by keeping the portions short like 200-400 meters each. As the season progresses this segment lengthens working up to 1k in distance. The pace for this segment will be 75-85% of the 5k pace. The length for this portion is much longer than the FP for example 1200-1400 meters. As the season progresses this segment is shorter. By the end of the season the recovery portion is equal to or shorter than the FP. If one is not able to hit the time needed in the RP then the faster portion does not lengthen until the RP recommended target is hit. To determine the RP- take 5k goal time pace per mile or kilo, convert to seconds, multiply by 1.15 for 85% and 1.25 for 75%, and convert back to minutes. For example: 15:00 is a 3:00 per k average= 180 seconds= 3:27- 3:45. The total amount covered for both portions is four miles with four reps of each FP and RP. 4. Increasing the length of the faster portion while decreasing the length of the recovery portion. An alternation workout can be adapted from anything to preparing to race a 400 up to the marathon. You can read more about Rick Becker in Runner's World Magazine.